The Mars Science Laboratory is on its way to the Red Planet, and its rover Curiosity should touch down next summer. If the mission hits pay dirt and comes across organic material, then one instrument in particular has the chemical tools for studying these building blocks of life. The instrument is called Sample Analysis at Mars, or SAM (or "Samantha" to those who built her). As the name makes clear, SAM is there to analyze samples taken from the surface and from the atmosphere. It uses sophisticated chemical lab equipment packed into the size of a microwave oven. SAM sits in the belly of the rover and will be fed solid samples by the robotic arm. It is one of 10 science instruments on Curiosity that all work together to study the past and present habitability of Mars. Curiosity's predecessors, the Mars Exploration Rovers Spirit and Opportunity, had a mantra of "follow the water." Now, the paradigm is shifting towards "follow the carbon," Mahaffy says. SAM will have the sensitivity for measuring organic molecules at a level of a few parts per billion, but there's no guarantee that any organics will be found. A more sure-fire bet is that the mission will better characterize whether Mars was ever friendly to organic compounds and the life that depends on them. The Curiosity rover is expected to reach the Martian surface on August 6, 2012. The chosen landing site is Gale Crater – a 100-mile-wide hole in the ground that likely accommodated an ancient lake long ago. "We assume water was there in the past, but we'd like to find out how long did it last," Mahaffy says. In the middle of the crater is a 3-mile-high mound that has sediment-layers that span a wide range of the planet's history. Curiosity plans to drive up the mound several hundred meters during its nominal mission of one Martian year (or roughly two Earth years). The strategy is to explore various rock layers that may have formed in both wet and dry environments. The instruments will work in concert to locate the most promising sites. The Mast Camera (MastCam) will scope out the terrain from 2 meters above the surface. The adjacent ChemCam zaps rocks with an infrared laser and analyzes the ionized vapor that is released. 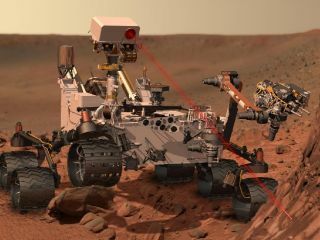 When this remote sensing identifies a small area of interest, the robotic arm descends to allow close-up investigation with the Alpha-Particle X-ray Spectrometer (APXS) and the Mars Hand Lens Imager (MAHLI). The arm also has a drill, which can grind into a rock and collect the fine powder for delivery to SAM and its analysis partner called CheMin. "We look at the data from the other instruments and decide whether a particular rock is really interesting enough to take a sample and 'ingest' it for CheMin and SAM analysis," Mahaffy says. CheMin is an X-ray diffraction instrument that can identify mineral structure and composition. SAM complements CheMin by examining volatile gases that may be trapped in ancient rocks. Rounding out the rover's suite of instruments are a subsurface water detector (DAN), a weather station (REMS), a radiation monitor (RAD) and a descent camera (MARDI). Do you smell what rocks I'm cooking? The SAM package can perform several types of experiment, but the big headliner involves heating rock samples and looking for organics in the gases that are released. In detail, a powder sample from the drill is dropped into a funnel and shaken into one of 74 sample cups. The sample manipulation system (SMS) moves the cup to an oven that ramps the temperature up to around 1000 degrees Celsius. A portion of the released vapor enters the Quadrupole Mass Spectrometer (QMS), which identifies the main constituents through their charge-to-mass ratio. The rest of the gas sample is sent through a highly-absorbent polymer that traps organic molecules. The trapped organics are then delivered to the Gas Chromatograph (GC), which is a set of six long columns that separate out the different molecular species. The final identification is done by the QMS, which can say, for example, how much of this or that amino acid or hydrocarbon is in the sample. "Gas chromatography-mass spectrometry is one of the most common analytic techniques on Earth, and we are just taking it to Mars," Mahaffy says. The challenge has been to package everything to fit within the space and energy constraints placed on the rover's instruments. The 30-meters-long GC columns, for instance, had to be wound up into tight spirals that saved space as well as "heating bills." For precise chemical measurements, SAM includes a second spectrometer, called the Tunable Laser Spectrometer (TLS). The TLS is designed to only detect a few simple molecules, but it can distinguish the different isotope concentrations. As an example, carbon dioxide trapped in a rock will contain both carbon-13 and carbon-12. The TLS will be able to measure this ratio and learn something about the atmospheric conditions at the time the rock formed. SAM will be able to compare this with current conditions, since it has inlets for sampling the atmosphere in the vicinity of the rover. Another gas targeted by TLS is methane. This greenhouse gas is a hot topic right now because trace amounts of it have been recently detected on Mars from Earth-bound telescopes. Surprisingly, this methane appears to come and go on a seasonal basis. The TLS instrument should be able to detect methane in the atmosphere at the levels previously observed. And since Curiosity will operate for a full Martian year, the team should also be able to verify if any seasonal variations are occurring. Mars is currently not a very friendly place for life's chemistry. Organic molecules can be destroyed by the unblocked UV light and cosmic rays, as well as oxidizing compounds in the atmosphere and soil. But organics may be preserved in safe havens below the surface. Curiosity may be able to drill down and tap into these preservation environments, which gives it an advantage over previous organic-detection missions on the Viking and Phoenix landers that could only scratch the surface. "We are also are not limited to one spot like Viking and Phoenix," Mahaffy says. The rover can drive around and search for the best rocks that might be hiding organics. Mahaffy and others do not want to oversell their chances. "We don't expect to find a site rich in organics from ancient times," he says. But if they did, then SAM could sort through the organics and begin measuring their isotopic abundances. This could say whether this complexity came from abiotic processes or if life is somehow involved. It's a big if, but that's what drives our curiosity.